This entry was posted in #amwriting, #ReaderFriday, Writing and tagged Big Foot, Creating a creature, Jordan Dane, Sasquatch, Skunk Ape by Jordan Dane. Bookmark the permalink. You are correct: Sasq’ets is the First Nation (Canadian tribes) word for sasquatch. I have written a novel about bigfoots (the designation that I, as an American, prefer). I appreciate the author of the piece trying to figure out the creature. But I agree that it’s difficult for me to identify with the thoughts, motivations, psychology, needs, and wants of a creature that is alien to human beings. I am afraid that we humans are locked out of the mind of bigfoots. During my own research, I corresponded with a number of bigfoot hunters and seekers. There is, as one can expect, great differences of opinion about what the creatures are all about. Some, like me, think they are flesh and blood creatures. Other people believe they are some sort of psychic animal that runs around the forests beeping thoughts from their skulls out into the ether. From there, the opinions are many and diverse. So for me to believe that a sasquatch/bigfoot is concerned about hurting a human female means that I have to know something about how a bigfoot thinks. But we don’t know. We just don’t know. The encounters with the creatures include accounts of bigfoot creatures protecting human children, even returning lost children to their parents, or their village. Then, there are the accounts of people finding huge bone piles. The bones, they say, belong to many different kinds of animals including, shudder, humans. The belief is that these bones are the leavings of bigfoot meals. What are we to make of how a bigfoot/sasquatch thinks and acts from knowing those two things about the creature? But a young woman, terrified because she is being chased by a huge animal that smells and is strong enough, she has discovered, to pull trees from the ground, turn them over and put them back into the ground. That would be a story that I would savor. Even King Kong, who could likely make anyone do anything he wants, had to be interpreted through the eyes of a young woman. The big guy protected the petite, frightened woman when he was attacked by biplane fighters as he stood atop the Empire State Building. His last moments, as he realizes he is going to die, he would not be able to convey to us. But the woman could. I hope the author takes another hearty cut at his story. I believe it’s well worth pursuing. I love your take on this, Jim. This story would be very interesting from the perspective of fearful townspeople applying pressure on a sheriff & town council after a mysterious death that’s blamed on a mythical creature. 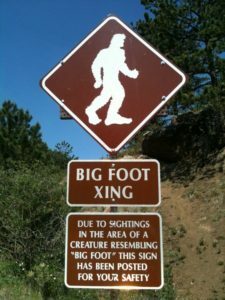 I can see the town happy to make tourist money off Big Foot sightings until this sudden death wakes everyone to the danger. How did the girl die? Is someone trying to blame the creature to divert attention? I agree that putting the reader into the head of the creature would be a challenge. If the story tracks Big Foot & confronts the creature, the scene could be done through the eyes of the sheriff, witnessing the actions of Big Foot, a creature he didn’t think existed. He may not believe the girl died at the hands of this creature, but he’s forced to take action. This could be an amazing story. The myriad conflicts eating at a sheriff who’s alone in dealing with a mysterious investigation and a mythical creature. What would the sheriff do? I would read that book. It’s a mystery crime story that confronts our deepest fears of the unknown. Keeping Big Foot a mystery would be key. Does the creature exist & did it kill? Yeah, I would read that. Sorry author, I find this a mess. There are some basic ideas about Sasq’ets that need to be straight in your mind and that you can effectively tell readers. Is Sasq’ets a highly intelligent creature from a race that has hidden from humans for generations or some kind of big bear? You have elements of both in this page. Does he slam through the woods or move with the silence of a tiger? Figure it out in your mind then tell us. “he notices her pointing at a man who appears to be climbing down the side of the road. It looks like he is headed towards the woods – towards him – but Sasq’ets can’t be sure,…” Get rid of the ambiguity. The man is climbing down the hill. I would know, at least enough to take actions for my safety, if the man was heading towards me. If you want some tension, if the man turns left, it is time to go, if he turns right, Sasq’ets stays. Thank you for sharing. It is brave. But, I have to say, if I read this on the back cover, I would not have reached then end before going to the next book. It’s always hard to read 400 words & tell where the story is headed. We can only say from the short intro if we like the author’s “voice” & if the premise is intriguing. I appreciate your honesty, Alan, and your insights into the mind of the creature. Thank you. And I agree that the problem is compounded by the animal sounding far too cerebral and knowing. I wasn’t buying the set-up at all. Though I did feel a little sorry for the beast for being wounded. But that’s not enough to engage a reader in an opening scene. So I think Jordan is right that an unknown writer will have trouble finding an editor to take this on, especially in today’s cautious market. Even if self-published, it will be hard to get readers to care with this opening. The suggestion to filter this through a human who readers can relate to is well taken. Well said, Kris. Thank you. After writing YA, I’m surprisingly open to unusual characters & points of view. To make this work, the author would have to have a complete view/concept of the world–but no matter what that is, starting with Big Foot doesn’t work. Thanks for your feedback. Every comment helps, as you know. I almost feel like I read a different submission from the other commenters. I do read a lot of fantasy, so perhaps that’s why I see this differently. Sasquatch is a mythical beast. The writer can make it smarter than a human or dumber than a stump. From the thoughts of the creature, it’s much smarter than even the best-trained service dog. It knows to avoid humans, and it knows that whatever has happened will bring trouble. It has alternate ways to get home and can make a reasoned decision on which to take. In this piece, it doesn’t sound at all like an animal but a member of an alternate intelligent race. Many, many SF and fantasy books tell the story from the POV of non-human characters. Even straight-up mysteries use animal POVs. (See the Chet and Bernie mysteries by Spencer Quinn, all of which are told from the dog’s POV.) I don’t see why this approach wouldn’t work here, especially given the intellectual level demonstrated by the creature. I agree that the writing needs work. There are some great touches, like the late reveal of the girl’s body. That would keep me reading. It would be nice if others could accept the premise offered by the author and provide more help to make the writing sparkle. Everyone in our TKZ family has a perspective on the writing & the premise. It’s good to get a varied response as feedback so the author can consider a number of comments. Thanks for your input & encouragement, KS. I looked at the Chet and Bernie mystery called Dog on It. Notice that it’s written in such a way to show immediate action and dialogue. That would be hard to do with a creature, unless our brave writer gives him a sidekick, perhaps a small animal friend. Without knowing more about what kind of story this is, it’s hard to give advice. I did give some suggestions for how to make the writing stronger that I hope will be helpful. I like the premise that this creature has an intelligence beyond what most people would ascribe to Bigfoot. The info about the wound and the dead human intrigued me and I would turn the page. I hope to read the full novel some day. Others have made suggestions about the writing so I won’t duplicate them here. Keep at it! I agree with Jordan about the title. I’d choose a title that will evoke a familiar image in the mind of the reader. The real excitement doesn’t begin until the reader learns about the body on the side of the road. Why not begin with someone finding the body? Reading blow by blow descriptions of every little nose scratch of the creature is not as interesting. I’d start with something that’s sure to get the reader’s attention: the body. Take a look at Jordan’s quick rewrite. Check out the first one on the list. As Jordan wisely suggested, consider writing this story from the point of view of a human, perhaps the person who will be responsible for tracking the creature. However, avoid laborious descriptions of every micro action, even if you tell the story from a different POV. The pacing was too slow. Again, avoid the micro actions and long sentences. These kinds of sentences are tedious for the reader. Long sentences slow the pace of a story. Be careful about overwriting. Tighten sentences. I’d like to see this piece written from the viewpoint Jordan suggested, brave writer. Give it a whirl, and see if you like it better. It’s fun to try out scenes from different viewpoints and pick the best one. Best of luck, and keep writing! Thanks for your thorough input, Joanne. Always appreciated. I’m sorry, but I couldn’t get past the first sentence. I don’t read stories written in present tense. I think it is faddish, unnatural and pulls me out of the story. Hi David. Thanks for your thoughts. Present tense is more popular in the young adult genre where young readers like the immediacy of present tense. I’ve written a YA story in present tense to test the technique, but it’s definitely an acquired taste in adult books. This could be a YA story. There’s not enough here to know for sure. Thanks again. maneuvering his massive frame carefully through the trees, dangling his arms loosely by his thighs. Can one move carefully and dangle at the same time? I like the mystery of why was he bleeding, why is the woman on the ground, was there a confrontation between them and, if so, who attacked who? I liked the POV. And how arrogant to assume this creature isn’t smarter than the humans. The intelligence & sensitivity of the creature would solely be in the vision of the author. Big Foot could be anything, right? I picture a creature like the elephant that grieves loss & has a strong sense of family. A profound innocence that’s admirable, a contrast to the scheming of some human beings. Thanks for your feedback, Michelle. It would be fun to brainstorm a creature, wouldn’t it? I would start by firming in your mind what kind of story you’re telling (fable, horror, suspense, etc.) and what your story is about at it’s heart. Then ask yourself if that core element can be conveyed through human characters’ pov or is the Sasquatch’s perspective vital in some way? If so how, why? What unique world view/experience does he bring that the reader must understand in order for your story to succeed in the way you want? If he just seems like another human, why bother? You’ll have to work very hard to make the reader connect with this character. My inclination would be to use a mix of human/creature POV, with more scenes going to the humans. But if you decide to take on the challenge of doing the whole book from the creature’s POV–you’re going to need the writing chops to pull it off. I suggest reading some articles or books about point of view, and deep POV techniques, as a start. I’d like to be much more in the mind and senses of your Sasquatch character. Which means you have to know and understand him intimately, as well as how to powerfully convey that picture to your readers. I think a story like this, well-told, could find a home. Sometimes weird ideas just won’t let you go. If this story is a book of the heart, go for it, dear author. There are billions of readers out there. But “out there” ideas also deserve and demand the writer’s very best work. I love this, Sheri. Lots of positives & areas for research. Thank you. P.S. Good examples Jordan. I sometimes get my back up when critiquers rewrite an author’s work as they would do it, but at the same time, nothing illustrates better than examples. I like how you handled that. Thanks, Sheri. I dislike imposing too much of a rewrite & prefer to work with the author’s ideas, but I struggled here. Bottom line is that none of us know the details of this whole story & the author’s vision, but we do know what might keep us reading. Like you, I’m open to re-imagining this story & find there’s enough here to be intriguing. Thanks again. Thanks for the feedback! This story is primarily told through the POV of a female detective, with small chapters of Sasq’ets interspersed throughout. I’ve been toying with the idea of opening with Sasq’ets, but based on the majority of this feedback, I will can that idea! I’ve also thought about axing Sasq’ets altogether, but for some reason I can’t seem to do that (I have tried). If I’m honest, I quite enjoy writing from his POV. Strangely, I’m not much of a bigfoot aficionado, so haven’t spent tons of time researching what other people think he’s all about. I will most likely stick to making him into the character he reveals himself to be through my own process. So far, he is quite human-like. Iskola is the name of the fictional Indigenous community that the murder takes place. I agree it’s not the best title, but I thought “Untitled” was worse. I wrote this section quite a while ago, so my writing has improved since then, haha! And I understand some people loathe present tense, but much like Sasq’ets, I can’t seem to dump it. Thanks again, I’ll go rock in a corner now (just kidding, sort of). Thanks for explaining, Veronica. Starts are my biggest challenge & it’s good that you tested the waters with a different beginning. Bottom line is that most comments were positive on the basic premise. Your story is different & has potential. You can write the bones of it & insert additional scenes if you want them included. I would respectfully suggest you research Big Foot, like Jim Porter (the first comment) mentioned. It would infuse authenticity & potentially expose you to new ideas on how to portray your character & your town. Thanks for sharing your story with us. It’s got potential, for sure. If you focus on a different start & hopefully take some of these comments in mind, I think you COULD have something commercial. Good luck! Thanks for writing back, Veronica. I wish more submitting writers would because you can often tell us things that illuminate the discussion at hand and sometimes make us reconsider our comments. As for that title…shoot, don’t sweat it too much. “Working title” or even “untitled” is fine until you figure things out. I struggle with titles with almost every book and strangely enough, the title usually sort of exposes itself — comes out of the shadows — toward the end of each book. Awesome feedback, Jordan. The other commenters have expressed a wide variety of praise and constructive criticism. It’s always interesting to see what resonates with one reader and doesn’t with another. Personally, I had a problem with the close third-person POV, just as you did, Jordan. Maybe it’s because we’re only getting a few hundred words, but the creature’s thinking with human intelligence without first grounding us in the world. It’s like any fantasy or piece of speculative fiction. You have to make the reader comfortable enough in the world to judge it fairly. From this opening, I’m just confused. I don’t know what’s going on with the throng of people or with the creature and his wound. Worse, I don’t know his intelligence level or his purpose in life. There aren’t any stakes raised. I’d love to know how this continues. It could be that the very next paragraph clears up some of these concerns. Thanks for submitting, Brave Author, and sharing your work with us! Thanks, Laura. Excellent point about the reader needing to understand the stakes and that takes time PLUS a character the reader has a desire to follow. After your comments, I thought about the creature being only shown rarely (to keep the mystery) & build on the natural fear of human beings when confronted by a beast. Yet in rare scenes toward the end, the author could show the creature through the eyes of a sympathetic human, then get into the head of a more benevolent & intelligent creature to show him as almost superior to the cruelty of the worst of mankind. It could be an interesting story about a comparison of mankind & Big Foot as creatures & our humanity. The more I think about the nuances of this story, the more I want to read it. It could be a real exploration of our base nature. I love that idea, Jordan! I’m always drawn to stories that involve dogs, for instance, who are shown to be above the pettiness humans possess, and therefore almost more intelligent. A great example is Dean Koontz’s THE DARKEST EVENING OF THE YEAR. Veronica, no rocking necessary! Sometimes it takes another pair of eyes to figure out weaknesses in a story and to see where people get confused. Your characters are real in your head, so it’s hard to be impartial 🙂 I thought the writing was solid.